Rep. 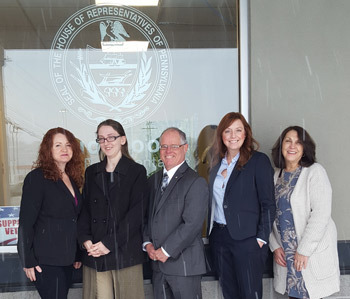 Bud Cook (R-Washington/Fayette) is pictured with his Bentleyville district office team (from left) Lisa Zaucha, Megan Gruzs, Rachel Willson and Janet Myers. BENTLEYVILLE – Rep. Bud Cook (R-Washington/Fayette) today announced the hiring of Rachel Willson, who is now serving as the new office manager and outreach specialist at his Bentleyville district office. A life-long resident of the Mon Valley, Willson was most recently employed as the first Thrift Store Manager at the Greater Washington County Food Bank where she successfully raised more than $100,000 in proceeds benefiting the food bank in only six months. In addition, Willson has extensive professional administrative, public relations, marketing, sales, social media and management experience. The Bentleyville office is located at Big Jim Plaza LLC, 55 Gosai Drive, Suite 112, and can be reached by calling (724) 669-2242. Office hours are Monday through Friday, 9 a.m. to 4:30 p.m. Available services include assisting District 49 residents with PennDOT paperwork, including driver’s license and vehicle registration applications and renewals; information and applications for senior citizen benefit programs, including Property Tax/Rent Rebate and PACE/PACENET prescription drug programs; securing birth and death certificates (photo identification required); organizing tours of the State Capitol; copies of legislation; and many others.